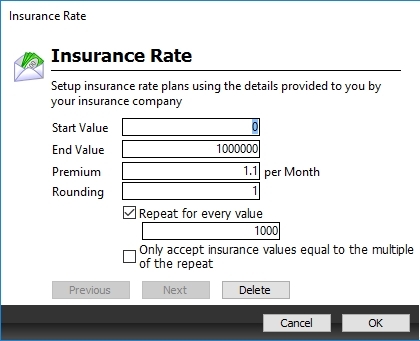 The Insurance Rates system allows you to setup pre-defined rates for blocks of insurance at certain values of coverage. This means you no longer need to train staff on the different insurance values for certain amounts of coverage; Storman will work it out for you. During the below process you will be setting up a insurance plan. Begin by selecting Insurance Rates under the Maintenance menu. End Value. This is the maximum amount allowed per this policy. Select OK to save and close your new insurance rate.